Natalia lives in Russia. 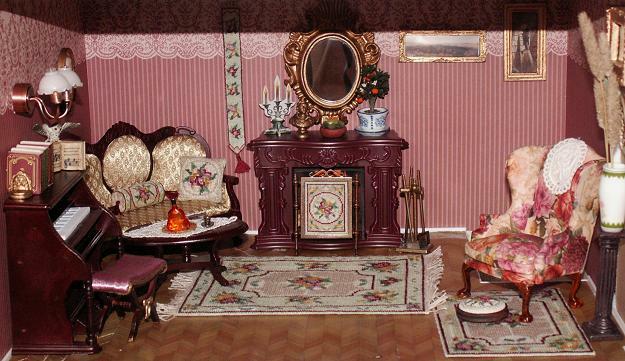 She has made a beautiful doll’s house room, filled with miniature embroidery using the “Alice” collection of kits. She started with the “Alice, small (green)” carpet, and added a narrow border to it, as the original design was a bit small for her room. With a spare piece of canvas she made a second, smaller version as well. If you look carefully, you’ll see that the room also contains an Alice cushion, bolster cushion, bellpull, footstool and firescreen, too. The metal firescreen frame has been painted in a lovely deep bronze shade, which really sets off the stitching. 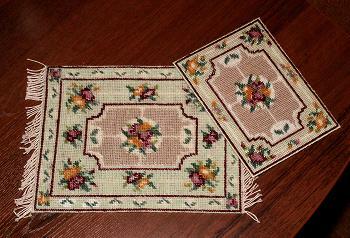 Here are the two adapted designs of the “Alice, small (green)” carpet – one made larger with the addition of an extra border, and one made smaller with a narrower border than usual. 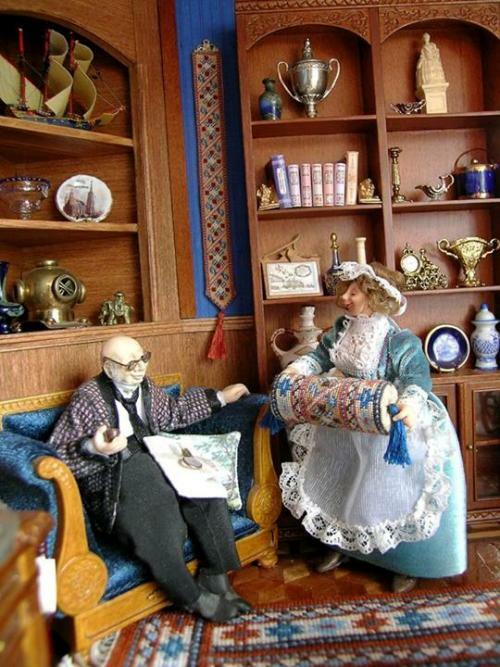 Recently, she sent these pictures of her doll’s house office. The room is nicely filled with lots of goodies. 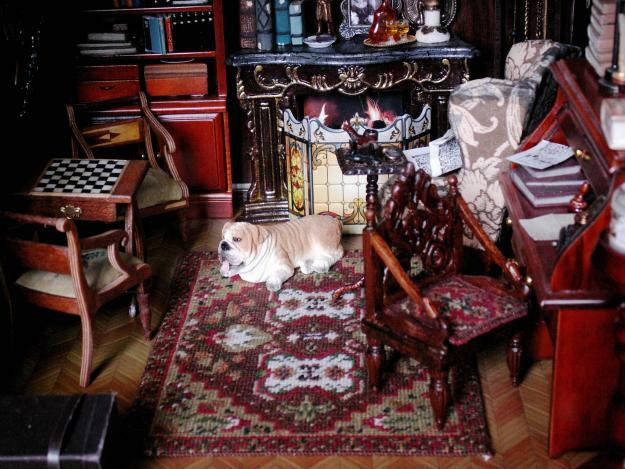 On the floor is an Yvonne carpet, stitched in colours which Natalia chose, which help add towards the heavy Oriental atmosphere of the room. She decided not to add a fringe to the carpet, so that the legs of the chairs nearby would be seen clearly. Natalia also made a seat cushion for the carved Indian chair on the right of the picture. 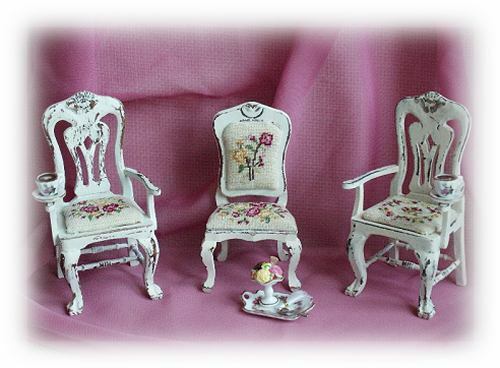 She finished the woodwork of the chairs in ‘shabby chic’ style, and then adapted/designed her own version of my Summer Roses designs to make a set of three chairs with the title ‘Summer Day’ as a co-ordinated collection. 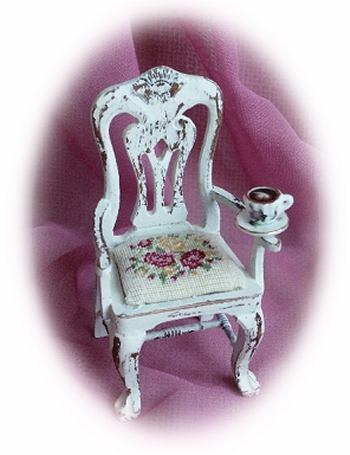 She based the shabby chic chair style on one that she saw on my Customers’ Gallery page, that another customer had sent in (the Customers’ Gallery page is always very inspirational!). and ‘Evening’ has a cup of tea. 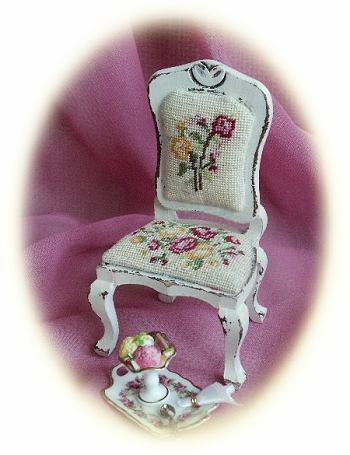 For the chairback on the ‘Noon’ chair, Natalia used one of the motifs from the Summer Roses teacosy kit, increasing the width of it slightly. For the other two chairs, Natalia used the tray cloth kit motif for one seat design, and added flowers in the center of a wreath for the other one. 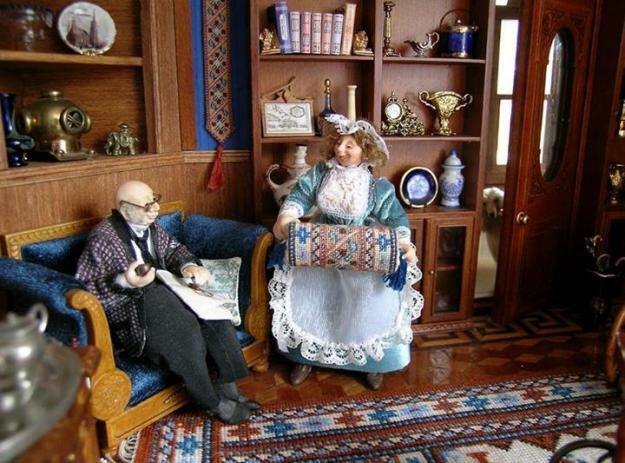 Natalia recently sent me these images of the Esther (large) carpet, which she has just finished stitching (spring 2014) for her doll’s house in Russia, where she lives. 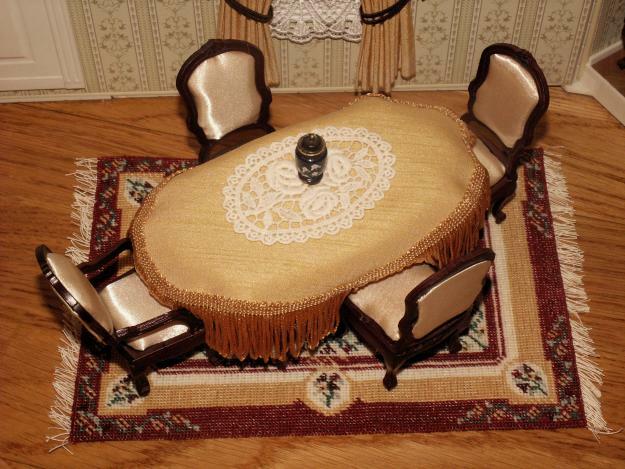 The carpet looks beautiful in her dining room, doesn’t it? 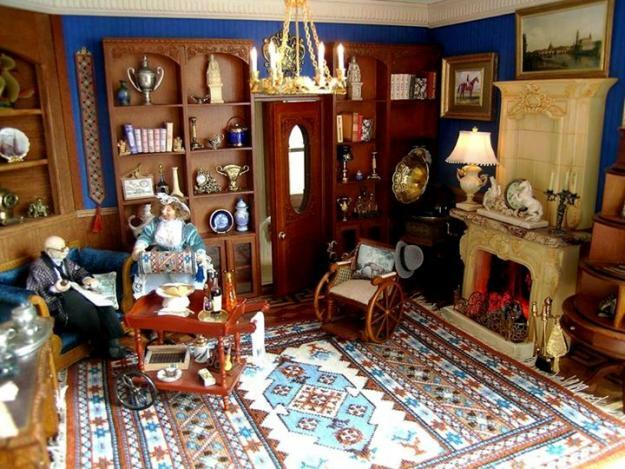 Natalia sent me two emails – the first one explained that, at first, she completed the carpet without a fringe, as she didn’t think that the room had enough space to allow her to add one to the Esther carpet. She only had 24cm of space, lengthways, so she adapted the border of the carpet (very successfully!) so that it would fit. The colours of her wallpaper and tablecloth echo the colours in the carpet. 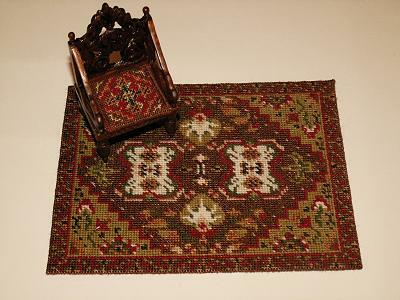 The Esther (large) carpet, with its short fringe added. 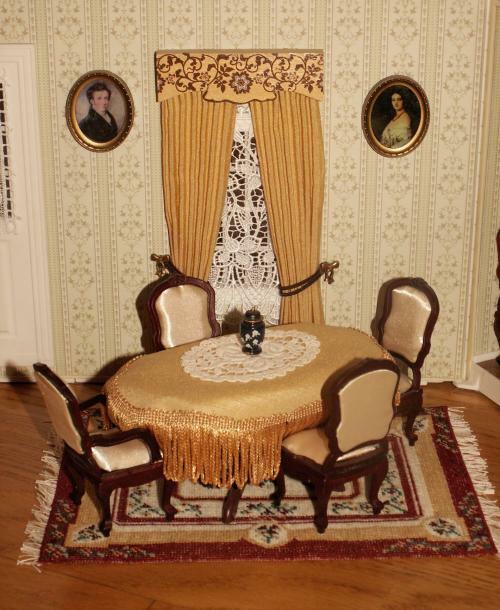 Natalia has just sent me some more pictures of the dollhouse stitching she has been doing lately (as of July 2014). She has been working on the largest carpet kit that I have in my shop, which is called ‘Tabriz (large)‘. It measures 12 1/4 by 9 1/2 inches, and is stitched in needlepoint on 18 count canvas, so it has been quite a challenge to get it completed – but doesn’t it look stunning? 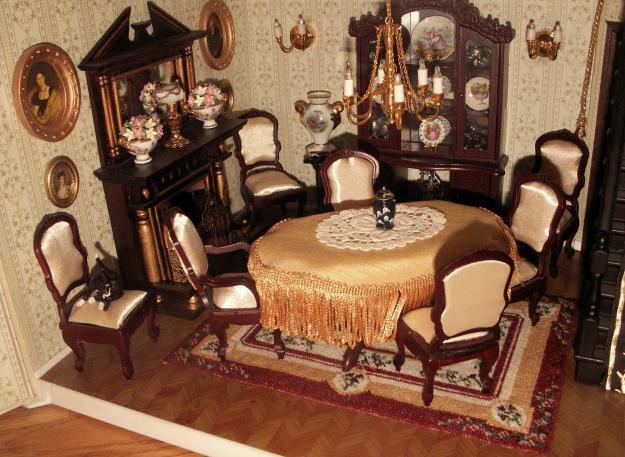 This dollhouse is not Natalia’s – she stitched this Tabriz carpet for her friend. If you look carefully, you will see that there is also the matching Tabriz bellpull on the wall between the two display cases. 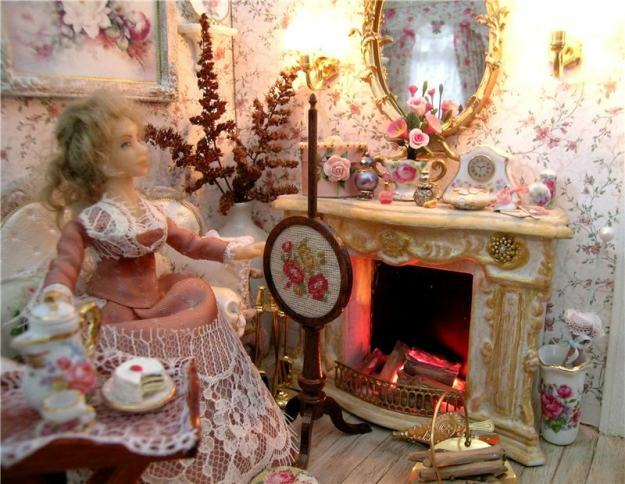 The lady doll is holding the Tabriz bolster cushion, too. I think that Natalia’s friend is a very lucky lady, to have Natalia to stitch for her! 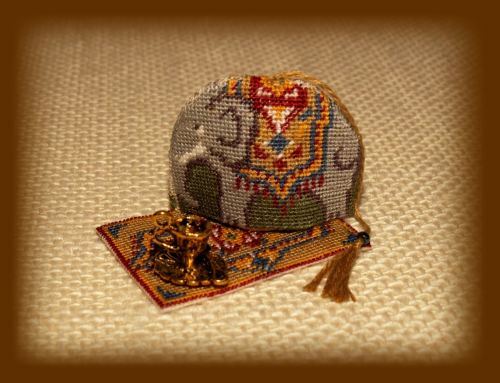 In early 2016, Natalia sent these images of her latest mini stitching finishes – the ‘Elephant’ teacosy and tray cloth set, and the ‘Natalia’ carpet (well, she had to do that one, really, considering her name, didn’t she?!). Natalia recently (Autumn 2016) sent me some new pictures of the stitching she has done. 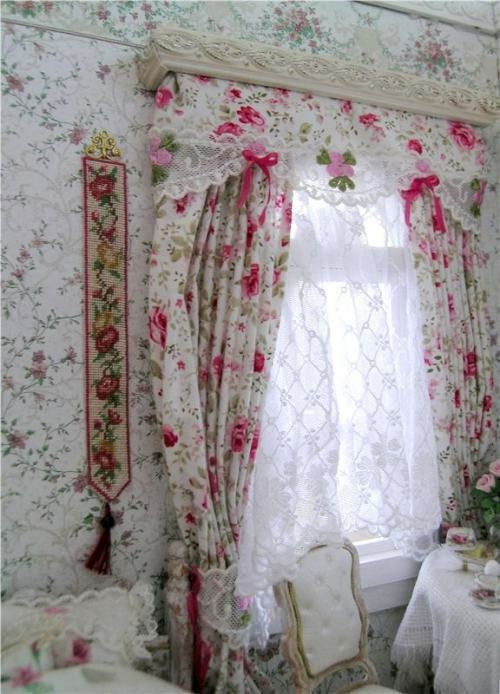 These are of the Summer Roses designs that she has made up, and adapted, in some cases, for her own doll’s house. 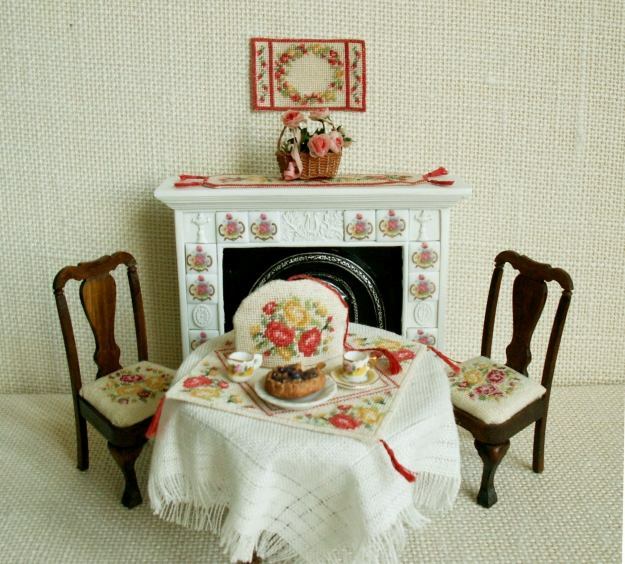 Here’s the pretty dining room setting that she has made, using various Summer Roses kits. 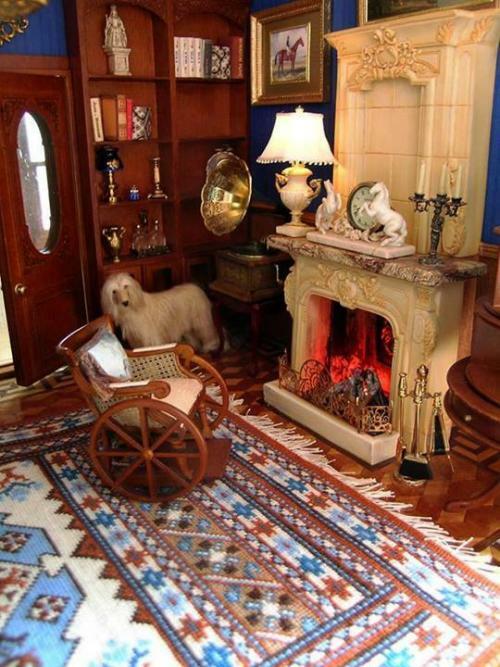 She has very ingeniously used the tray cloth as a picture above the fireplace! Natalia’s collection of “Summer Roses” themed stitching. 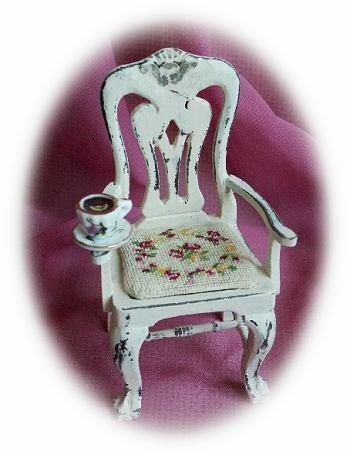 On the table there is a teacosy, made up as per the kit, on 32 count silk gauze. But look at what else she has done! 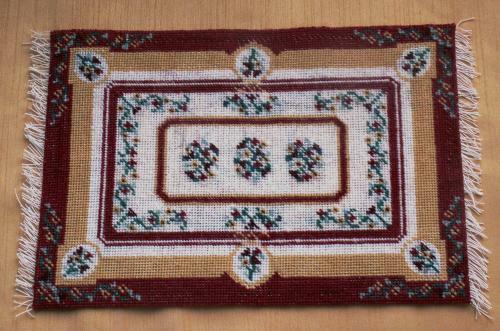 She’s taken the teacosy motif, and created a very beautiful table topper, using repeated motifs at the corners. How clever! 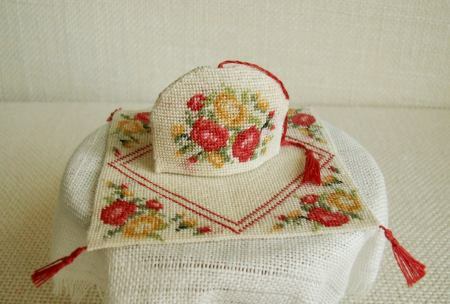 Natalia’s “Summer Roses” teacosy, on her own table topper. 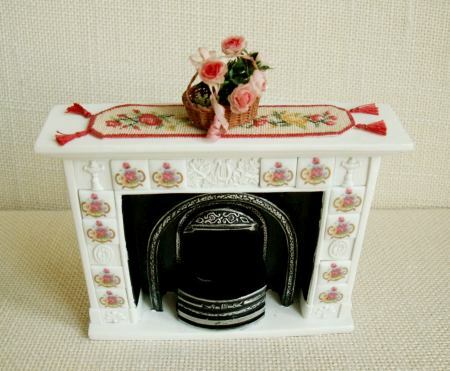 On top of the mantelpiece is a table runner. 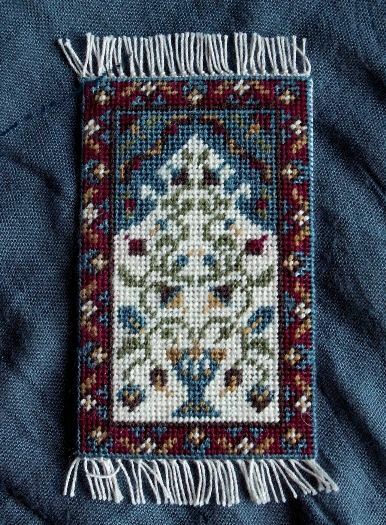 In the kit, there are no tassel instructions, but Natalia has made tassels as in the bellpull kits, and added them at the corners of her runner, making her one unique. Natalia sent me this image, as a digital ‘Christmas card’, just before Christmas 2016. 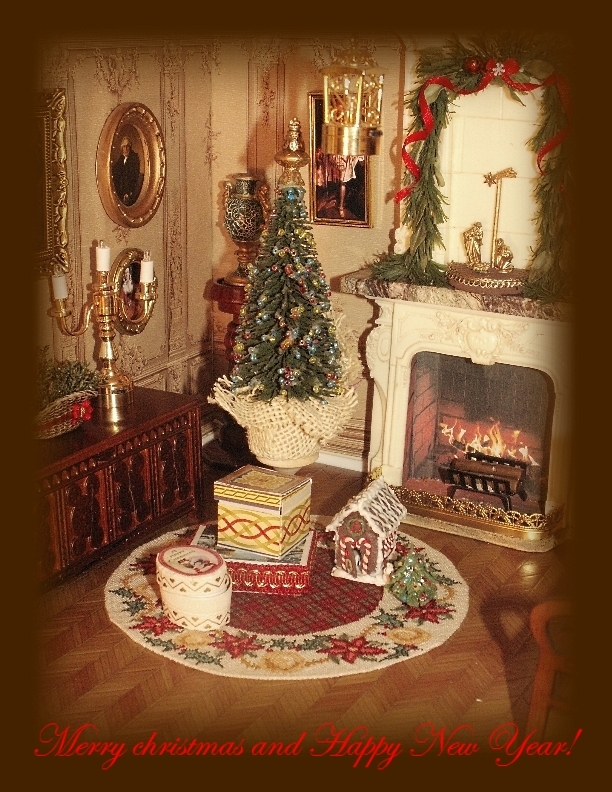 It features Christmas gifts displayed on a ‘Poinsettia Garland’ Christmas tree mat, in a gorgeously festive room.